Barcelona remains at the top of La Liga courtesy of Alexis Sanchez’s injury time winner against a resilient Sevilla side. Gerardo ‘Tata’ Martino made two changes to the side that defeated Valencia at the Mestalla, two weeks ago. Christian Tello started along side Lionel Messi and Neymar in the attacking three, while Xavi Hernandez joined Andres Iniesta and Sergio Busquets in midfield. Unai Emery made four changes to the side that drew Malaga two weeks ago, adding Jairo Sampeiro and Vitolo to the attacking three behind Kevin Gameiro. Sebastian Cristoforo played with Stephane M’Bia in the double pivot of Emery’s 4-2-3-1, while Beto started in goal. This match came to life in the final 15 minutes once Messi gave the Catalan side a two-goal lead – yet despite their victory, Barcelona’s issues at the back are now palpable. Emery’s men faced an onslaught of pressure in the opening 45 minutes but were only down a goal, due to their shape without the ball. Emery’s men dropped into two banks of four with Gameiro and Rakitic up top, aiming to close down Busquets and Xavi – when they dropped deeper. M’Bia was instructed to track Iniesta’s movement, while Cristoforo occasionally pressed Xavi. However, what was most impressive was Sevilla’s ability to limit the gaps in midfield and defence. Barcelona constantly aimed to penetrate through the middle but was unable to find the final ball or gap in the final third, and that was down to their compact shape and organization. This affected Messi’s influence on the match, as he often dropped deep into midfield, attempting to drag defenders out of position and find his own gaps – but the Argentine forward had little success. 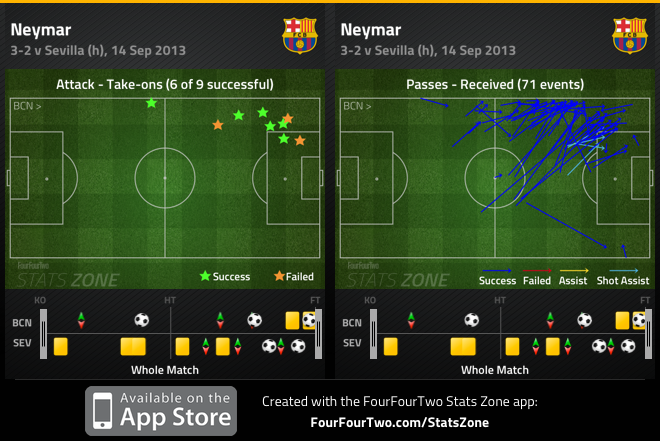 Martino’s men did enjoy success in the first half, mainly down the left hand side. It was a constant source of attack, as Tello and Dani Alves were peripheral figures for large portions of the opening 45. Neymar received the ball countless times and was encouraged to take on Coke Andujar. The Brazilian winger constantly got the better of the Sevilla fullback – due to his marvelous skills and Jordi Alba’s ability to get forward – but his decision-making and quality in the final third was subpar. 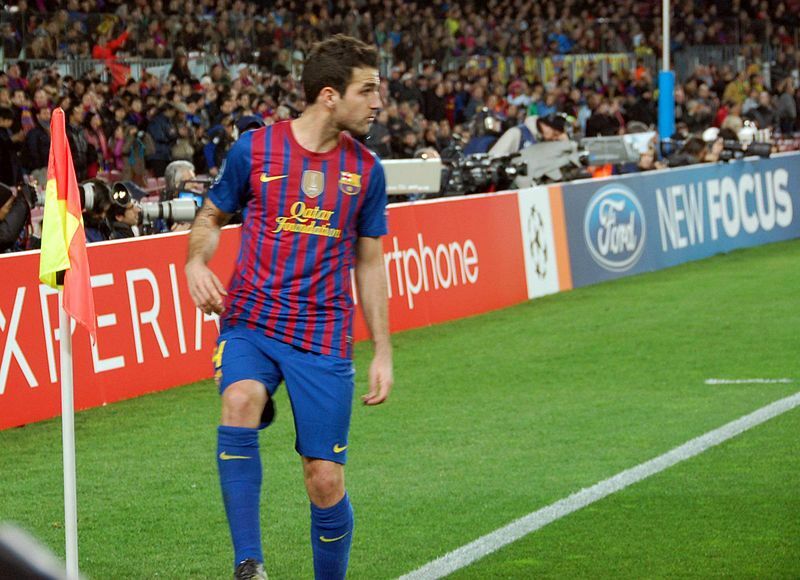 Alba was forced to leave the match midway through the first half, thus allowing Adriano to make an appearance. This now presented Barcelona with a balance, yet neither fullback was eager to push forward – but when Alves did, he was moving centrally. Neymar continued to trouble Coke for the duration of the match, but Barcelona’s opener was orchestrated on the left flank. Adriano finally surged forward and provided a cross to the far post, which Alves nodded past Beto. It was one of the few time Alves broke forward due to Vitolo’s admirable will to track back and protect Alberto. Martino’s men struggled to find openings in the Sevilla defence, but their narrow shape allowed Barcelona’s left-sided players freedom to penetrate. Barcelona continued to dominate possession in the second half, as they searched for a second goal. Vitolo drifted centrally early in the second half, looking to find gaps to exploit, but the Sevilla attacker realized the service was limited. Yet, two wide men enjoyed a terrific second half, due to Adriano and Alves’ will to surge forward, thus leaving space available behind them to penetrate. Jairo and Vitolo isolated the Barcelona fullbacks, and got into dangerous positions in the final third, which led to corner kicks. Sevilla’s first goal stemmed from majestic work from Vitolo. The Sevilla attacker won the ball on the break and attacked space after being played in by Marko Marin. Vitolo danced past Busquets and Gerard Pique, then laid the ball off for Ivan Rakitic to fire past Victor Valdes. Besides an improvement in the minimal pressure applied by Sevilla, their were two elements of attack that led to their comeback – Jairo and Vitolo’s threat in wide areas on the break was the first positive aspect in Sevilla’s second half resurgence. Martino has been heavily criticized for the club’s decision to ignore their defensive issues. The Catalan club is in desperate need of a top-class centreback, but continue to have faith in a Javier Mascherano – Pique partnership. Also, over the past few years, Barcelona has lost players that possess an aerial threat, such as Carles Puyol, Eric Abidal, Yaya Toure and Zlatan Ibrahimovic. This season, Barcelona’s slow defenders have been exposed and their inability to successfully defend set pieces has also been highlighted. Helder Postiga made a near post run and freely nodded in a corner kick at the Mestalla, two weeks ago – and the same issues recurred against Emery’s men. In the 63rd minute, Cala snuck between Alves and Busquets and nodded a corner kick at the near post, past Victor Valdes. The goal was wrongfully ruled off for a ‘ghost’ foul, which should’ve equalized the scoreline. Martino noticed his side’s disadvantage in height, so he took his players off the post to develop a numerical advantage in the box. Cala got the best of Busquets and Fabregas in the 82nd minute, but the Sevilla defender nodded his header wide of the net. But eight minutes later, Coke earned the equalizer, as the Sevilla fullback was left unmarked to hit the corner kick on the volley, past Valdes. For all of Barcelona’s talent in attack, they still look frail in defence, and it’s an issue Martino needs to address, if the Catalan side aims on claiming trophies this season. There’s no question about Cesc Fabregas being Barcelona’s most influential figure this season, and he continued to showcase that in the second half. Minutes upon his arrival, Fabregas made a simple run between the lines to free space for Messi to make a pass, and run into space to tap in Barcelona’s second goal of the night. Martino’s men began to find gaps of space between the lines and in the final third in the final 15 minutes of the match, and Fabregas played a key role in their success. His direct forward runs into pockets of space and behind the defence, along with his persistence to get into key areas in the final third, opened up space for Messi, Neymar and Sanchez to penetrate. Fabregas’ movement and direct approach opened up space for Barcelona’s attackers to express themselves – prior to that they struggled to penetrate in central areas, thus highlighting the impact of his appearance. Martino’s men remain unbeaten in league play, as Fabregas’ arrival shifted the match offensively for the Catalan side. It seems evident that the Spaniard is now a key asset to Barcelona, and it’ll be interesting to see if he can sustain this good run of form throughout the season. Unfortunately Mike “the Mod” was missing today on the 2 Guys and a Mike podcast, but Paolo and Tyrrell shared their insights on El Clasico, why Barcelona has struggled as of late and Messi vs Maradona. Hope you enjoy!